ORLANDO, Fla. -- Twenty years ago, former Nets shooting guard Drazen Petrovic participated in the 3-point shootout at NBA All-Star Weekend in Orlando. Saturday night in Orlando, Nets shooting guard Anthony Morrow celebrated the legacy of Petrovic, who was killed in a car crash in 1993. Morrow wore the Croatian's authentic No. 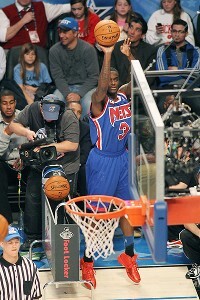 3 jersey that was designed by Mitchell & Ness, the company that made throwback uniforms popular. While Morrow couldn't make it to the semifinals -- Petrovic did in '92 -- he embraced the opportunity to honor the Nets legend, who averaged 21.4 points per game in his last two seasons in New Jersey. Anthony Morrow honored Drazen Petrovic on Saturday night. "It was a great feeling," said Morrow, who finished the first round with 14 points. "I just wanted to make his family and his country proud." Q.) What was it like to wear Drazen's jersey? A.) It felt good. I like the Drazen jersey. We should wear these sometimes, man. It was cool. I'm glad I had a chance to honor him, even though I came up short. Q.) Will you wear it again in a future shootout? A.) I don't know if I'll wear this again. I think it's a one-time tribute thing. Q.) What did you take away from tonight? A.) Hopefully next year, I'll get a practice run before I go out there. But it was fun just to shoot the ball. If I had got to the second round, I would've had all the jitters out of my hand, and would've made even more shots. But it was fun, man. I had a good time. Q.) Did shooting in the event feel different than usual? A.) Not really, but I had problems getting the ball up right. I was trying to keep my eye on the rim, so in the future I'll make sure I glance down at the ball. Because I'm not really losing time with it. I probably rushed with the money balls. But, like I said, it was my first time. I got that top-of-the-key rack, I felt good, but I got tired in the last one. The money balls are very important. If I made two more of those, I would've had 18 or so. Q.) Did you hear from the NBA stars sitting courtside? A.) I heard Deron [Williams]. Deron was over there cheering me on, so that was cool. Q.) How's the overall All-Star experience been for you? A.) It's great. I'm competitive, so I'm pissed off I didn't win it. I really know if I got to that second round, I really would've made a good run for it. But I was messing with the other guys, like Kevin [Love]. I was like, "Now ya'll wanna shoot. First, you make one out of the first two racks. Now ya'll wanna shoot." In the first round, they were just on fire, but I'm really happy for Kevin [Love], man. He deserved it. Q.) What's the best way to shoot in this kind of thing? Jumping or standstill? A.) You've just got to shoot your normal shot. When you go around [the rack], you have to make a judgment. I didn't really have a chance to really do that. That's the main thing. But overall, I think I learned from the stuff I did and seeing what the other guys were doing. Q: What's your plan for the rest of the weekend? A.) Oh man, just have fun. Go back, see my family, just hang out. Q.) How do you see the second half of the season starting off? A.) I think we can make a strong push. First we got Brook [Lopez] back. MarShon [Brooks] is fully recovered from his foot injury. I mean, we've got little nagging injuries, but this break has been good for us. We've got Dallas, another good team, on the road [Tuesday night]. We're playing well on the road. We've got to come to practice focused Monday and just get ready for the second half of the season. Q.) What are the team's keys for turning things around? A.) The difference that Brook is making, the spacing that he's creating for everybody else so far. He hasn't even gotten his legs or his wind back. It's made it easier for Deron. Of course, he still has to be aggressive offensively and so do I, and so does MarShon. Kris [Humphries] is going to do his thing. All the pieces are falling in. We've got everything we need. [DeShawn Stevenson] is making shots now. So as long as everybody does what they're supposed to do, and we stay together as a team, I think we can make a run.